B- Cell precursor ALL is primarily a disease of childhood with 75% of patients under the age of 6 with both blood and bone marrow involvement. Extramedullary involvement is typically of the central nervous system, lymph nodes, spleen, liver and testes. The morphology of cells is mainly FAB L1 or L2, where only a small percentage of patients have a mature B-cell immunophenotype. 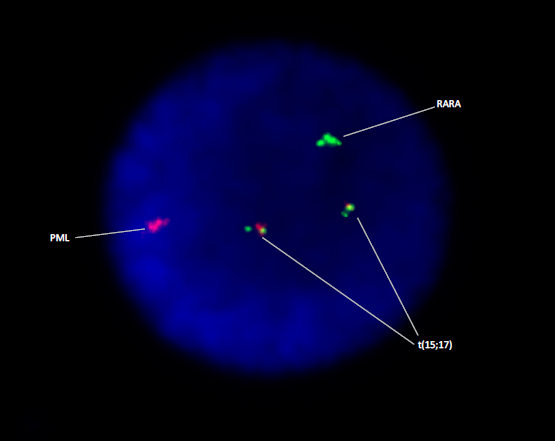 Cytogenetics still provides the main standard for classification. T-cell ALL accounts for approximately 15% of childhood and 25% of adult ALL patients and has a high risk for malignancy in both groups. Genes involved in various stages of thymocyte development are rearranged or deregulated, resulting in a multistep process for pathogenesis, consistent with multiple genetic changes seen in leukemic cells. Acute myelogenous leukemia (AML), the most common type of leukemia in adults with incidence greatly increasing after age 55-60, constitutes 70% of acute leukemias. AML is characterized by an excess accumulation of immature myeloblasts in bone marrow, leading to a lack of differentiated granulocytes, monocytes, thrombocytes and erythrocytes. Classification of AML into major subgroups from morphological, cytochemical and immunophenotype criteria has resulted in the following FAB subtypes, M0-M71,2: minimally differentiated AML (M0); without maturation (M1); with maturation (M2); acute promyelocytic leukemia, hypergranular (M3) or micro- and hypogranular (M3v); acute myelomonocytic leukemia (M4), including M4Eo with eosinophilia; acute monoblastic leukemia (M5a) and monocytic leukemia (M5b); acute erythroleukemia (M6) and acute megaloblastic leukemia (M7). A more recent WHO classification defines four subgroups: 1) AML with recurrent genetic abnormalities (i.e. as revealed by karyotype or tested for by FISH, above); 2) AML with multilineage dysplasia; 3) therapy-related AML (t-AML) and myelodysplastic syndromes (t-MDS); 4) not otherwise categorized. Chronic lymphocytic leukemia (CLL) and its nodal variant, small lymphocytic lymphoma (SLL) account for 7% of all B- and T/NK-cell lymphomas. Chromosome aberrations occur in more than 80% of CLL with successful stimulation (i.e. with a B-cell mitogen). The neoplastic cells of CLL have low spontaneous mitotic activity and therefore mitogens are necessary. Although standard karyotyping of cells from unstimulated cultures of peripheral blood or bone marrow, as well as cultures stimulated with a B-cell mitogen (interleukin, pokeweed, TNF-α, TPA or some combination) are recommended, FISH is recommended in addition to chromosome analysis. MDS, has an increased incidence in older patients and is a heterogeneous group of clonal bone marrow disorders. They are characterized by the presence of dysplastic hematopoietic cells and cytopenia that can progress to an acute leukemia. 10-15% of patients with MDS have acquired the syndrome through therapy related (t-MDS) treatment following chemotherapy or radiation. Conditions that can mimic MDS include vitamin B12 or folate deficiencies, infections and congenital conditions. A normal karyotype occurs in about 30-60% of MDS patients. If a clonal abnormality is detected about 25% of them can further progress to AML. Chromosome abnormalities in primary MDS, in order of frequency, include -7/del(7), -5/del(5), +8, abnormal 17p, -Y, del(20q), and 11q23 rearrangements. Prognosis typically worsens if more than one abnormality is present. Multiple myeloma (MM) is an incurable malignancy with a yearly incidence in the US of ~14,000 people and comprises ~2% of deaths from cancer. The median survival rate for MM is about 3 years. Clinical features include: bone pain; anemia; repeated infections (immunoinsufficiency); features of renal failure and hypercalcemia; abnormal bleeding, lytic bone lesions and destruction of bone tissue; occasional macroglossia; carpal tunnel syndrome; diarrhea due to amyloid disease; hyperviscosity syndrome with purpura, hemorrhage, visual failure, CNS symptoms, etc. MM and non-IgM MGUS (premalignant monoclonal gammopathy of undetermined significance) are neoplastic monoclonal proliferations of bone marrow plasma cells with phenotypic features of PB/long-lived plasma cells. MM is distinguished from MGUS by having >10% plasma cells (PC) in BM. Both MM and non-IgM MGUS show marked increase in prevalence with age, and more prevalent in African American than Caucasians by about 2 fold. The origin of plasma cells is from B-cell immunoblasts which in turn originate in germinal centers of lymph nodes or spleen. Plasma cells initially secrete IgM and later typically migrate to bone marrow to differentiate into long-lived plasma cells, responsible for the heterogeneous production of immoglobulins IgA, IgD, IgE and IgG. Myeloproliferative neoplasms (MPNs) are a group of diseases of the bone marrow in which excess cells are produced. All MPNs arise from precursors of the myeloid lineages in the bone marrow and all of which are related, many evolving into myelodysplastic syndrome and acute myeloid leukemia. This particular neoplasm, MPN, is classified in the hematologic neoplasms category and is further broken down into four main myeloproliferative diseases. These four are categorized by the presence of the Philadelphia chromosome. Essential thrombocytosis (ET), polycythemia vera (PV), and myelofibrosis (MF) are all Philadelphia chromosome negative, and chronic myelogenous leukemia (CML) is Philadelphia chromosome positive. B-Cell lymphomas are “blood cancers” in the lymph glands. They develop more frequently in older adults and in immunocompromised individuals. B-Cell lymphomas include both Hodgkin’s and non-Hodgkin’s lymphomas and are typically divided into low and high grade. Prognosis and treatment depends on the specific type of lymphoma as well as the stage and grade. Common types include diffuse large B cell lymphoma, follicular lymphoma, marginal zone lymphoma, mucosa-associated lymphatic tissue lymphoma, small cell lymphocytic lymphoma, chronic lymphocytic leukemia, and mantle cell lymphoma. Chromosomal translocations involving the immunoglobulin heavy locus (IGH) is a classic cytogenetic abnormality for many B-Cell lymphomas. In these cases, the immunoglobulin heavy locus forms a fusion protein with another protein that has either pro-proliferative or anti-apoptotic abilities. Approximately 10% of non-Hodgkin lymphoma cases are due to T-Cell lymphomas. They are compromised of four classes; Extranodal T cell lymphoma, Cutaneous T-Cell lymphoma, Anaplastic large cell lymphoma, and anioimmunoblastic T-cell lymphoma based on cytologic grading. The survival rate of T cell lymphoma varies widely depending on the subtype. Treatment options also vary, but the standard lymphoma therapies including chemotherapy, radiation, stem cell transplantation, and surgery are effective. treatment with an EGFR-directed kinase inhibitors treatment. Melanoma is a type of skin cancer which forms melanocytes (pigment-containing cells) in the skin. It can originate in any part of the body that contains these particular cells. The primary cause of melanoma is ultraviolet light exposure. Treatment of this disease includes surgical removal of the tumor, if discovered early, or chemotherapy and immunotherapy. Radiation -therapy is useful for melanomas that have relapsed or have spread. Melanoma is less common than other skin cancers, however it is more deadly if not found in the early stages.